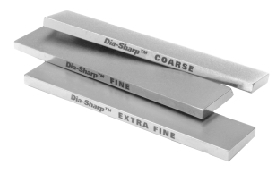 DMT® Dia-Sharp® Whetstones are the highest precision engineered of any continuous diamond sharpeners so are guaranteed to give you the finest possible edges. Their carefully graded mono-crystalline diamond surface will almost certainly outlast any of the competition in our experience, and if you choose a cheaper product you’ll most likely end up buying one of these anyway, having wasted your money elsewhere! 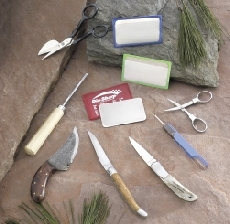 The range of grits or microns sizes leaves the competition standing and with the addition of the StarkieSharp Leather Sheaths you will have as perfect a sharpening system as you can possibly get. 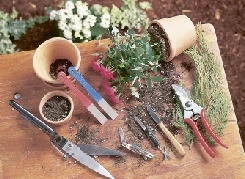 DMT® Dia-Sharp® Mini-Hone® - Amazingly Versatile! These are very popular for those of you who want a large sharpening surface for chisels and plane irons at a budget price. 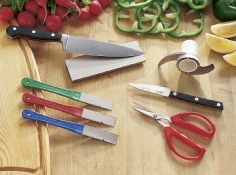 They’re great for knife sharpening for butchers and chefs for example and what I use to repair knife edges at shows after you’ve been using those tungsten carbide pull through knife wreckers! 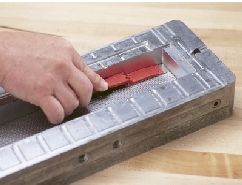 These have the largest sharpening area on the market and are great for those of you who like to sharpen on a “football field”! 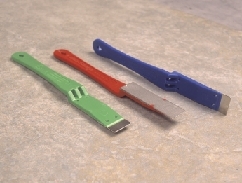 They are great for sharpening big plane irons and chisels, for example if you’re into green woodworking with oak beams, timber frame buildings etc.They come with Non Slip Feet and there is an optional Leather Sheath available. 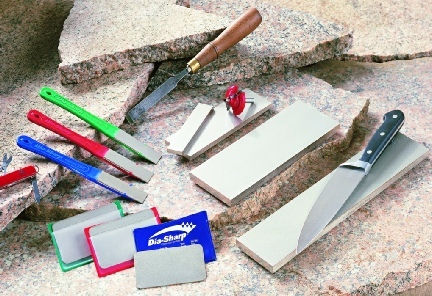 These Diamond Whetstones are ideal for both knife & tool sharpening for builders, chefs, caterers, householders, woodworkers and countrysports enthusiasts. 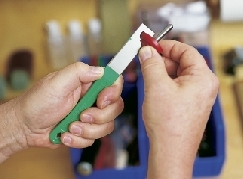 These are really handy and light in your tool bag for chisel and plane iron sharpening and ideal for woodturners, particularly with a Leather Sheath and Honing Paste. 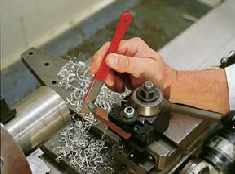 See the (Woodturning Page.) They are also very popular for axe sharpening and are the sharpener of choice (single or double sided) of the amazing axe men we meet at shows. They come with Non Slip Feet and there is an optional Leather Sheath available. 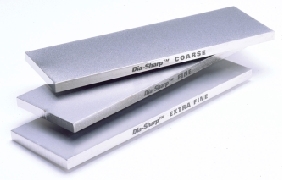 The DMT® Dia-Sharp® Range of Diamond Whetstones is enormously versatile! 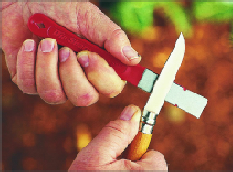 They’re ideal for both knife & tool sharpening for the building trade, chefs, caterers, farmers, householders, woodworkers and countrysports enthusiasts. 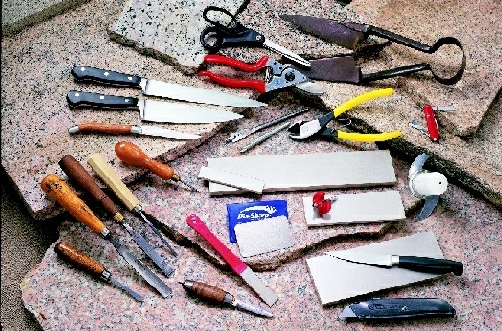 The smaller ones of these are really handy and light in your tool bag for chisel and plane iron sharpening and ideal for woodturners, particularly with a Leather Sheath and Honing Paste. 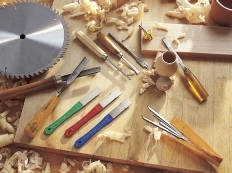 See the (Woodturning Page.) They are also very popular for axe sharpening and are the sharpener of choice (single or double sided) of the amazing axe men we meet at shows. 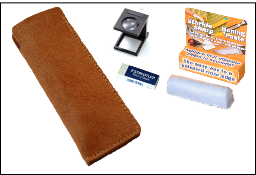 Most come with an optional Leather Sheath or choose a complete Honing Kit which will guarantee you an amazing polished razor sharp edge without the skill normally required. Come to one of our shows to learn how! DMT® Dia-Sharp® So, So Versatile!